EGP-NA headquarters in Andover, MA. Photo by Robert Benson. One of Massachusetts’ fastest growing renewable energy providers prides itself on the sense of community that connects its growing workforce. When it came time for a new headquarters to accommodate its burgeoning business, Enel Green Power North America (EGP-NA) sought a new space that would tangibly express the company’s Open Power identity and its mission to lead the energy transition, nationally and globally, that will open energy to more people, new technologies, new ways of managing it for people, new uses, and more partnerships. 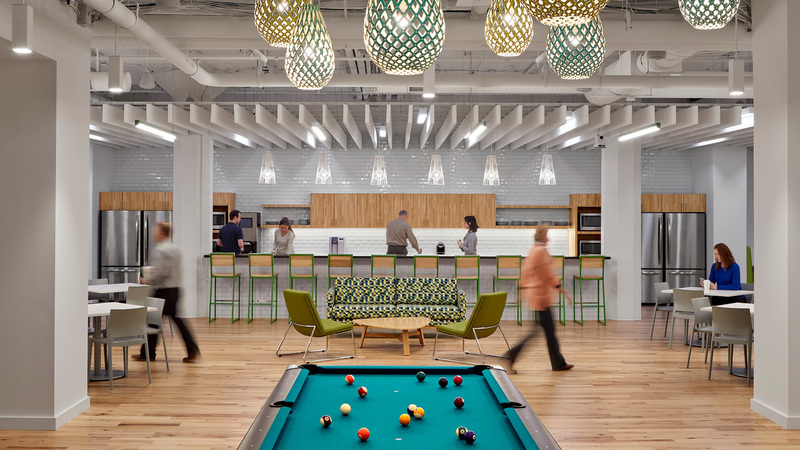 This passion for innovation and sustainability is reflected in all aspects of the design and materials while making its employees feel at home. 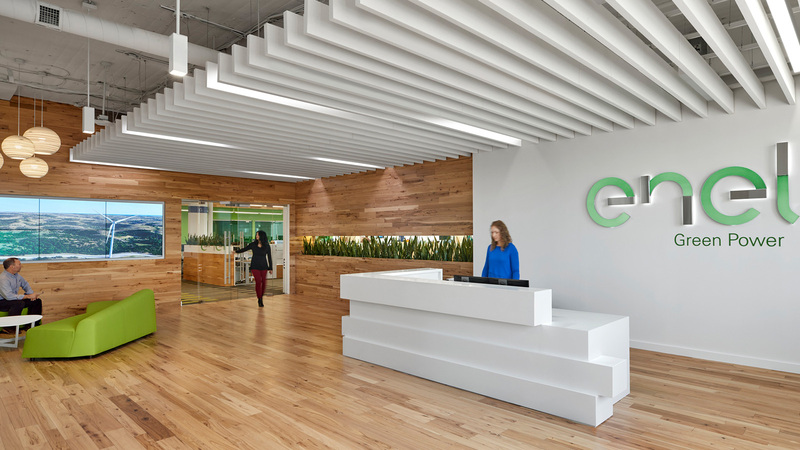 Relocated to a renovated wool mill, according to EGP-NA’s Head of Facilities Christian Missaglia, the new office reflects a design based on the needs of Enel’s employees. 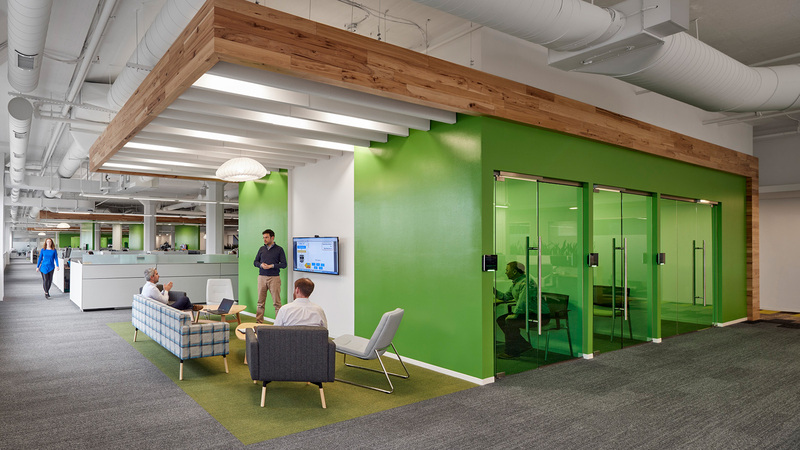 Multiple collaboration spaces invite communication and interaction. A large, central café serves as a catalyst for socializing and bonding. In a nod to Enel’s core business, there’s an electric charging station installed in the parking area. 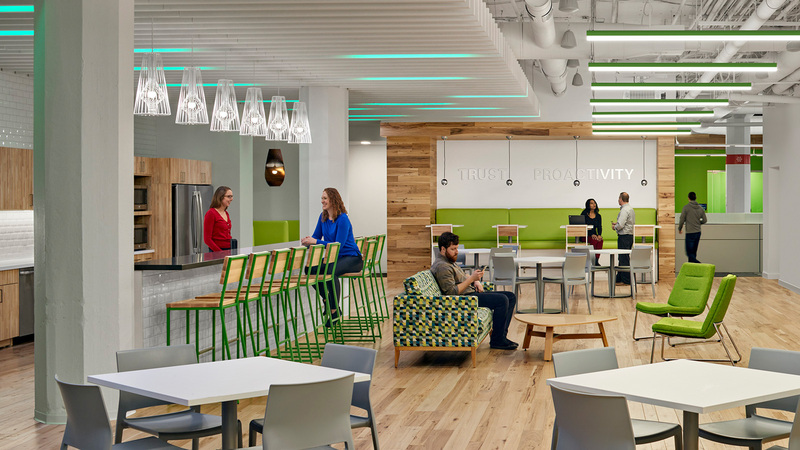 In addition, sustainable materials, including FSC-certified wood floors and LED lighting, are used throughout the open workspace. Taken together, these features help achieve the primary requirements for the design: clean, modern and inviting. In addition to aligning with the company’s focus on sustainability and innovation, EGP-NA’s new workspace is home to the company’s secure and state-of-the-art control room, where EGP-NA monitors and manages its entire portfolio of renewable energy plants. Visibly positioned on the building’s façade and throughout the interior, a re-designed and digitally-inspired logo symbolizes the new technology-forward space and spirit of the company. In designing the new logo, EGP-NA sought the help of IA Senior Designer Jen Servies to ensure that the design of the new space would align with the new logo and brand identity. “There was a strong sense of mutual trust as we translated their revamped identity into the built environment” said Servies. This instance of synergy and creative process as Servies and Enel seamlessly worked together, serves as a metaphor for the larger project.